Constant short cycle times and bonding layers with high uniformity. 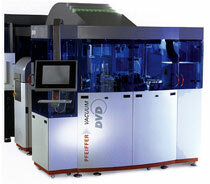 Pfeiffer DVD LINE is a fully automatic system for production of more than 30,000 DVDs per day. This fully automatic system produces DVDs at a cycle time of 2,5 seconds (more than 30,000 DVDs per day) and is compatible to all models of injection molding machines. A specially designed cooling conveyor transports the DVD half sides in vertical position from molding to metallizing. Two integrated Pfeiffer Vacuum Single Layer Metalizer apply the metal layers L0 and L1 respectively. Dual spin stations provide for constant short cycle times and bonding layers with high uniformity. The double sided irradiation with Xenon flash lamps (mercury free) guarantees excellent curing results with minimum heat load. The freely adjustable lightning sequence provides tilt control. A second cooling conveyor provides for relaxation of the discs before inline quality control and guarantees optimum test conditions for all physical parameters prior to placement on the 8-spindle output buffer. A main feature of the system is the stable (steady) temperature of the DVD-substrates during all process steps. The use of servo and stepper motors for disc transport and process control and video system enables simple handling and excellent control of the DVD production process.